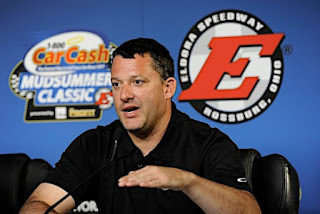 Tony Stewart says his Eldora Speedway dirt track is ready, willing and able to host the NASCAR Xfinity Series, with the possibility of a Monster Energy NASCAR Cup Series somewhere further down the road. The Rossburg, Ohio oval hosts NASCAR’s Camping World Truck Series tomorrow night, in the sixth annual renewal of the Eldora Dirt Derby, and the sport’s collective attention will be firmly focused on the Trucks; arguably for the only time all season. 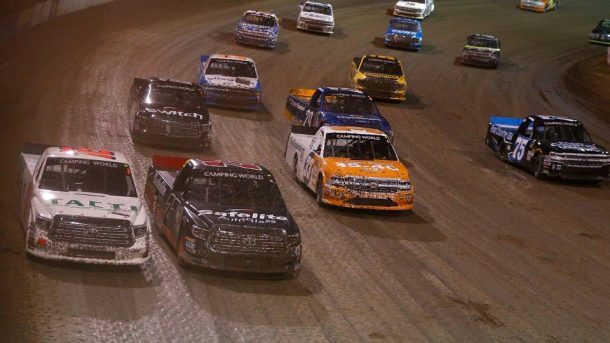 NASCAR Trucks on the Eldora dirt has become a “can’t miss” affair over the last six seasons, with race fans braving a short night of sleep in order to witness a unique, one-of-a-kind event that happens just once each season. Stewart thinks he can work the same kind of major on the Xfinity and Monster Energy Tours. "Maybe one of these days, we'll get an Xfinity or Cup race here," said Stewart on SiriusXM NASCAR Radio’s Tradin’ Paint Tuesday. "We've proven we can run the vehicles here. And the Truck drivers that have never been here before can get around really well. “If a Truck can get around here, a Cup or Xfinity car can do it too. Who knows? I never thought we would ever have a Camping World Truck Series (race), so maybe the dream will start to get Xfinity and Cup here, too." 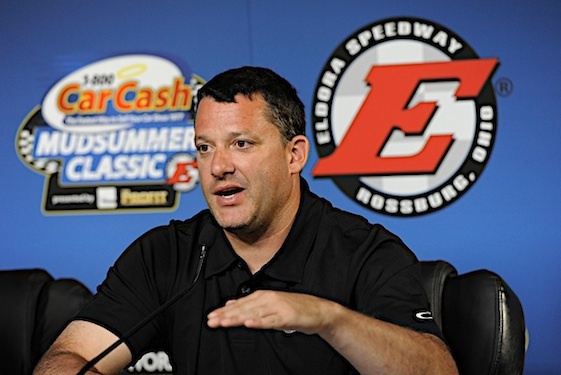 Stewart encouraged fans to get behind the idea, saying, “"Start to think about putting pressure on NASCAR. I think we need to get an Xfinity race here. And if it were successful, maybe we could get a Cup race at Eldora. “I think that's something everyone wants to see. So, I think we need to pressure NASCAR to get an Xfinity race here, as well." The idea is an interesting one for a sport desperately in need of new ideas, new events and a new way of doing things. There’s not much new in NASCAR Land these days, unless you count the weekly 8x10 sheet of rules adjustments; something that fans long ago announced their distaste for. In recent years, NASCAR’s idea of “shuffling the deck” has been to run the same old races in the same old places, with only minor changes in date. Unfortunately, a trip to Great Aunt Enid’s house is as painful in August as it is in May. Same plastic-laminated sofa, same slobbery kiss on the cheek, same stultifyingly dull stories about wayward second-cousins you’ve never met, and never will. It’s time to ditch Great Aunt Enid, head for the amusement park and strap into that new, gravity defying roller coaster. 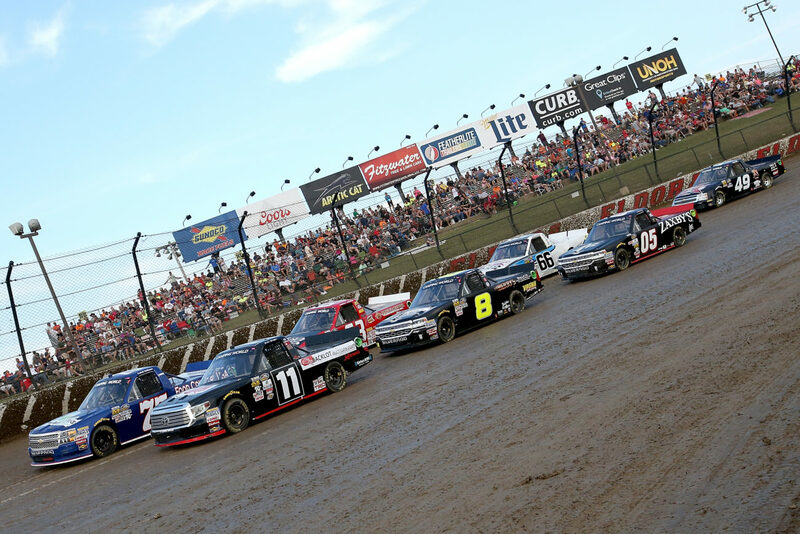 Xfinity and Cup Series racing at Eldora – or any other short track, for that matter – could be just what the doctor ordered for a sport fighting to maintain the attention of its fan base. It’s different, it’s unique and it’s never been done before; something that absolutely cannot be said for any other event on the 2018 NASCAR calendar, with the exception of September’s debut of the new Roval at Charlotte Motor Speedway. Much like its Truck Series counterpart, an NXS or MENCS race at Eldora would spotlight driver skill over technology, offering a much-needed break from the incessant aerodynamic, Optical Scanning Station and body-tolerance talk that dominates the sport today. A .015-inch difference in the flare of a fender means virtually nothing at Eldora, and a trip to the wind tunnel is no more valuable than a trip the local Dairy Queen. Snuggle your right-rear tire up against the cushion, mash the gas and turn right to go left. There are at least three potential drawbacks standing in the way of NXS or MENCS racing at Eldora Speedway. Even if Stewart finds a way to double his track’s capacity, the Rossburg half-mile will struggle to accommodate a Cup-sized crowd. “Sold out” NASCAR races are few and far between these days; a far cry from the time when tickets to the Bristol Night Race were fought over in Divorce Court and awarded to family members in wills. Having a date on the NASCAR calendar where demand dramatically outstrips supply and the term “get your tickets early” once again applies can only be good for the public’s perception of the sport. If there are more race fans than seats for them to fill, so much the better. Of additional concern is the impact of an NXS or MENCS race on the current Truck Series date. 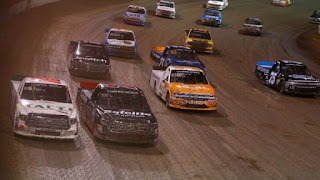 The Eldora Dirt Derby is unquestionably the most anticipated race on the NCWTS schedule. The Cup Series has premier events like the Daytona 500, Southern 500 and Coca-Cola 600, while the Xfinity Tour takes center stage during its annual Dash 4 Cash Series. The Truck troops have Eldora, and only Eldora. Expanding the track’s NASCAR schedule should only occur if it does not diminish the standing of the existing Truck Series event. And finally, there is the question of where an Eldora Cup race would come from. With 36 point-counting events and two exhibitions already on the schedule, NASCAR currently has the second-longest season of any professional sport, trailing only golf. Adding a 39th race is virtually unthinkable, meaning that in order for Eldora to secure a spot on the MENCS calendar, some other track will have to relinquish theirs. It’s difficult to imagine International Speedway Corporation, Speedway Motorsports Inc., Dover Motorsports, Hulman & Co. (owners of Indianapolis Motor Speedway) or Pocono Raceway’s Mattioli Family handing over a multi-million dollar MENCS race date to Eldora, out of the goodness of their hearts. In order for Eldora to secure a spot on the Cup Series schedule, NASCAR will almost certainly have to take a race from another track, against its will. That is something the sanctioning body has been unwilling to do in the past. There is little question that NASCAR needs a serious dose of new, different and exciting. Racing at Eldora would be all three. Dale Earnhardt, Jr. spoke for many today when he tweeted, “Hey @TonyStewart, this @XfinityRacing owner would love to have a race @EldoraSpeedway on the schedule. What say you @NASCAR? Let’s do this already!" Is the idea of NXS or MENCS racing at Eldora risky? You bet. There is always a risk in trying something new. Maybe that new gravity defying roller coaster will have us all hurling up our lunch by the end of the day. But hey, at least we tried. It doesn’t take a microscope to see that NASCAR has some challenges to deal with these days. In-person attendance is down across the board, with television ratings for the first half of the 2018 season plummeting 23% from last year; from 3.31 million viewers in 2017 to 2.54 million this season. Neither of these situations happened overnight. They are the result of a series of changes – both societal and within the sport – that have dramatically changed the face of the game. The sport faces major problems that unfortunately will not be solved by minor corrections in course. And while it’s easy to identify those problems, solutions are tougher to come by. NASCAR has made a number of rule changes in recent seasons, often bowing to pressure from drivers and team owners, at the expense of fans. When asked for feedback on this year’s Monster Energy All-Star rules package, the sport’s marquee drivers were almost unanimously negative, saying it made the cars too slow and too easy to drive. Interestingly, drivers who routinely race in the middle and back of the pack had an entirely different take, hailing the new rules package for tightening competition, increasing passing and improving the racing. NASCAR chose to listen to the frontrunners, waving off further use of the package in 2018, despite speaking glowingly of it just a few weeks earlier and promising to roll it out at least once more before season’s end. In recent months, we have heard drivers – and in some cases, team owners– utter words to the effect of, “I don’t care about what’s best for the sport, I care about what’s best for me.” That is a dangerous precedent to set, in an era when driver feedback seems to guide the sport’s decision-making process more than ever before. During his tenure, NASCAR founder Bill France, Sr. would happily listen to everyone with an opinion. He would then do what he thought was best for the sport and its fans. Today, NASCAR listens to everybody, reacting (it seems) to those who speak the loudest, whether they are paying customers or not. Fans have long complained about a lack of competition on NASCAR’s 1.5 mile ovals. It is a longstanding problem that has plagued the sport for years. And yet, after discovering a promising potential remedy for those complaints at the All Star Race, NASCAR waved it off under pressure from its athletes. NASCAR these days is like a restaurant, where the chef loves his lasagna recipe and refuses to make changes, despite frequent complaints and a dwindling customer base. If things continue unchanged, the chef will be alone in his kitchen, wondering where the diners went. Two decades ago, drivers seldom competed at NASCAR’s highest level until they reached the age of 30. Today, however, drivers make it to the Truck and Xfinity ranks while still in their teens, with many advancing to the MENCS before they’re old enough to drink champagne in Victory Lane. There’s nothing wrong with that, per se. Drivers like Chase Elliott, Ryan Blaney, Erik Jones, Bubba Wallace and William Byron are absolutely NASCAR’s stars of the future. But with a total of one win between them – Blaney’s victory for Wood Brothers Racing in 2017 at Pocono – they are not yet the stars of today. Promoting up-and-coming stars at the expense of established veterans was a critical miscalculation by NASCAR. It alienated the older drivers – who spend considerably more time in front of the TV and radio microphones – and placed an undue burden on burgeoning drivers who currently lack the experience to win races and contend for championships. Greatness is not awarded, it is earned. And NASCAR fans are too smart to buy into a group of drivers who are not yet running at the front of the pack, much less contending for titles. NASCAR needs to refocus its marketing and promotional effort on winners, not up-and-comers, allowing its next generation of stars to mature organically, without being burdened with unrealistic expectations. There is also too much emphasis on parts and pieces these days, rather than on people. NASCAR becomes more techno-centric with every passing day, seemingly oblivious to the fact that its fanbase couldn’t care less about self-adjusting panhard bars, computer-based inspection processes and the latest, high-dollar carbon fiber doohicky. Far too often in recent seasons, Monday morning water cooler talk has centered on pre-race inspection failures and post-race penalties, rather than on racing. Wednesday has supplanted Sunday as the most important day of the NASCAR week, and our sport is worse for it. Nobody tunes-in to watch technical inspections, and nobody buys a ticket to watch the umpire. It’s high time for NASCAR to take the focus off the parts and pieces, and put it back on people. There are some amazingly talented athletes playing the game these days, and some captivating personalities, as well. While we’re at it, let’s stop talking about how safe stock car racing has become. Nobody wants to see the Flying Wallendas fall to their deaths from the high wire, but the knowledge that it could happen is what draws crowds and sells tickets. The Daring Young Man on the Flying Trapeze isn’t so daring when he works with a net, and right now, NASCAR spends entirely too much time talking about the net. And finally, it’s time for NASCAR to dramatically re-shuffle the cards and revamp its Monster Energy, Xfinity and Camping World Truck Series schedules. With the exception of the Eldora Truck race, most fans cannot remember the last time a new track was added to the agenda. And after a decade or more spent circulating through the same venues – year after year after year – stagnation has begun to set in. The fans have spoken. They want fewer “rubber stamp” 1.5-mile ovals, and more short tracks. More road courses. More new, more exciting. Moving old races to new dates is not nearly enough to create a much-needed dose of excitement. In order to give the paying customers what they want, it’s time for NASCAR to interject a three or four-race series of short track events into its MENCS schedule, returning legendary venues like Hickory, Nashville or Oxford Plains to the competitive calendar for the first time in decades. First-time venues like Myrtle Beach or Berlin would further sweeten the competitive pot. Imagine the fun of watching Kevin Harvick, Kyle Busch, Jimmie Johnson and company slug it out on a third-mile short track. Then imagine how just a handful of races like that could re-energize our sport. Those races cannot happen without some major concessions by both NASCAR and its teams. 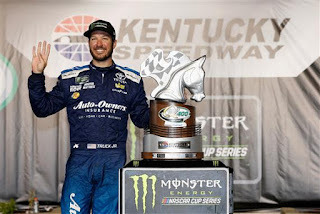 In order to make Cup Series racing a reality at short tracks with limited seating, NASCAR must dramatically cut its sanction fee, eschewing profit – just a few times per season – in favor of excitement, drama and a dose of something new. Race teams must agree to race for a downsized purse – again, just a few times per season – choosing to do what’s best for the sport, instead of what’s best for their own bottom line. All of these changes are needed, and all of them are doable, if the will to change is there. We have arguably already waited too long.